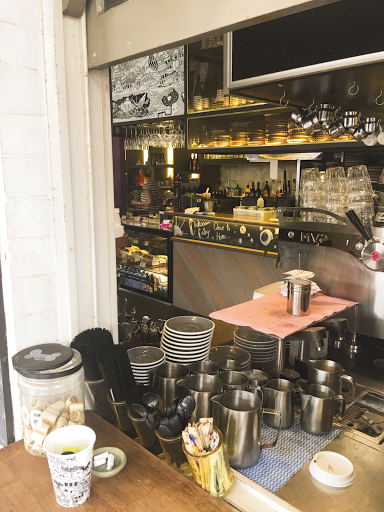 Sydney Shop Girl: Lovin' Life 27/10/2016: Same But Different. Lovin' Life 27/10/2016: Same But Different. It's been an off the beaten track kind of week. Last minute routine changes, alternate routes to familiar destinations - that kind of thing. The good thing about all this change has been the chance to explore my world using a different mode of transport and also to observe its dynamics at a different time of day. I took the train in to work yesterday and scored a free walk up King Street in the process. King is ever more eclectic than ever before if that is at all possible. There's even more quirky eateries and quite a few fancy boutiques now dot the retail landscape. I wonder if this means gentrification is officially a thing in Newtown? 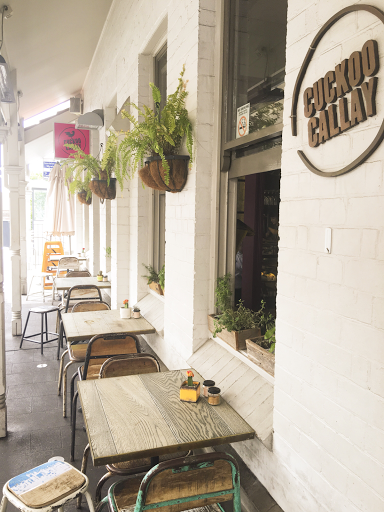 Cuckoo Callay is a pretty cafe that greets you as you leave Newtown train station. Its blackboard is typically Newtown with its dry, caffeine related humour. While its takeaway coffee cups are typical pieces of Newtown art. There were so many tempting eateries and stores I could have taken photos of (The Academy Brand is on King Street!! But sadly, none of the new boys range is) but it was this street library that most deserved a photo. If you've a little (or grown up) boy in your life, The Academy Brand is one to consider for their wardrobes. The boys label isn't online yet but is stocked at David Jones. I like the way they've worked the button down, collared shirt and tailored shorts combo into men's casual wear and given it all a bit of an edge. Thursdays are usually that day off during the week that's so close to the weekend, I sometimes treat it like a Saturday. I get in a bit of exercise, potter around the house doing chores and then get stuck into breakfast and a coffee. Except I had to get a routine fasting blood test today and the blood collection place didn't open until the extremely late (for my stomach) time of 7.30am (!). The outrage. It was all the excuse I needed to check out the new Salt Meats Cheese and Harris Farm arrangement that's next to Coles at Westfield Bondi Junction. The good thing about being there on a Thursday morning around 8 is that everything was immaculately displayed and there wasn't a single customer other than myself. All the colour and all the abundance! I specially like how the melon comes with either a thoughtful wedge of lime or a passionfruit half. There's a whole area next to the bakery that has a definite Whole Foods market kind of vibe. There's a bank of special loaf slicers at the Bread & Butter Project outlet. How's your week been? Same old same old or same old but different? All that good looks super delicious - great pics! 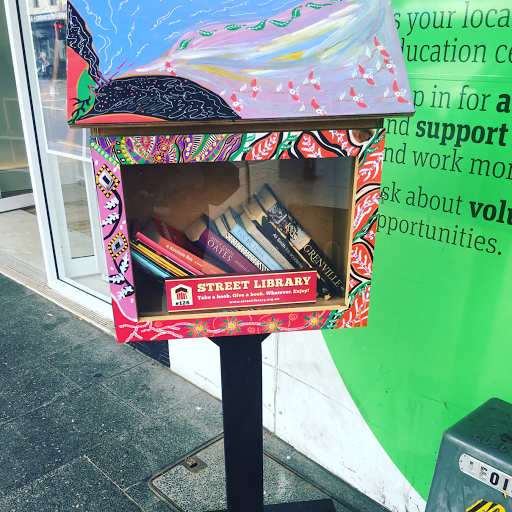 Love the idea of the street library. Such interesting finds. There are so many things I miss about Sydney! Stunning photographs and so colourful. You've reminded me of life when I was in Brisbane and when - after years of catching a bus into work - I had to start catching the train and working in a different part of the inner city. It was so new and was nice to have that change! That bread thing looks like the way I would lose a finger... I am not to be trusted around any kind of heavy machinery. Newtown sounds Very Cool Indeed. A street library! What is that? How does it work? I like it already. I've now put King Street on my list of places to cruise around on Mumager patrol. Thanks for joining the Lovin' Life Linky! My goodness what a magical place you live. Those veggies looked amazing and a street library, wow! I've been enjoying my alternate route to work too. Those vegetables are an amazing display. So tempting. I like the street library too. a really good idea. The Last Week of October. Life This Week: Two Months 'Til Christmas Eve. Lovin' Life 23/10/2016: A Highlights Reel. Wynyard Walk and Barangaroo South. A Day at Taronga Zoo. Life This Week: The Night Noodle Markets 2016. Life This Week: Ten Things I Like About Me. I'm Feeling Human Again. Dr Oetker Mug Cakes. Mornings. A Bit of Hair and Beauty. Beauty in the Bag at Chemist Warehouse. Long Weekend Saturday. Dietary News.